According to 2001 census more than 12,62,570 children were working in the age group 5-14 years in Rajasthan. Brick industries are a hazardous industry because it produces lot of dust in the work place. The children who work in brick industries are the children of migrant laborers; they accompany their parents to the brick chambers and help their parents in their work. In the survival struggle parents do not bother about children’s education. Background:A small initiative of educating the children of migrant laborers working at brick kilns in the Garudwasi area of Chaksu block (Jaipur district, Rajasthan) was initiated in the beginning of 2014. 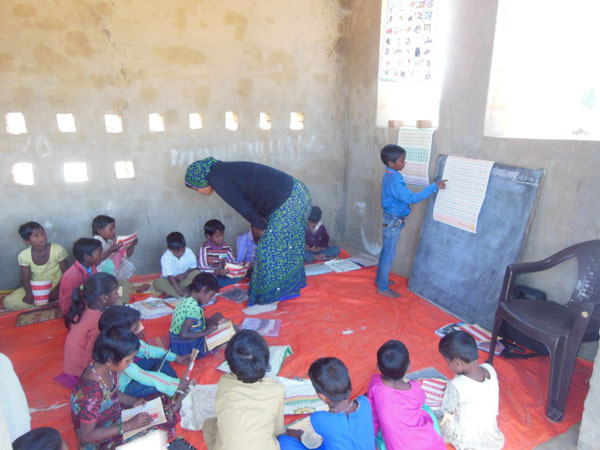 A humble beginning with one school serving 30 students at Mahadev Brick Kiln in 2013-2014 increased to four schools (175 students) in 2014-2015 and finally to 10 schools (600 students) covering 12 brick kilns in 2015-2016. All this was made possible by support from well wishers and friends. The parents and students have been happy with the school that it has been set up at their brick kiln. Parents report that if the classrooms had been located in other more distant areas they would not have sent their children to school. Some of the children who attended this year were those coming to school for the first time. Since all the students came from very poor financial background sweaters and shoes along with two pairs of socks were distributed to all students during winter. It was a necessary protection from the cold for the kids. Sukhdev belongs to Rampur village, Tehsil Milak, district Rampur Uttar Pradesh. He came to Rama Brick Kiln with his father, brother and sister. His mother died 6 years ago. They don’t have much land at their native place so his father used to work in the rice fields. This was not sufficient to run the family. As a result they had to migrate to the brick kiln in search of livelihood. They had a school in their village but teacher there “beat more and taught less”. 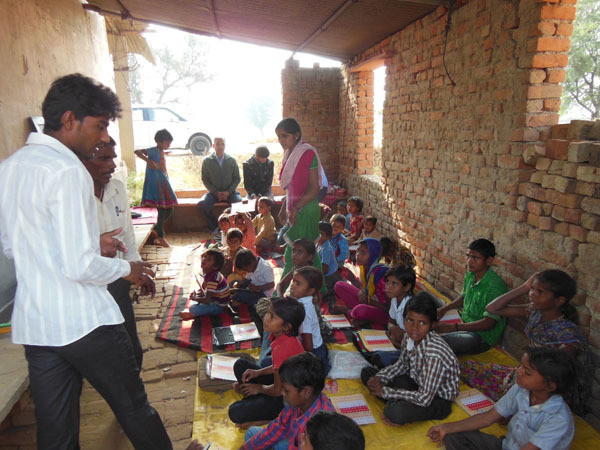 He is very satisfied with the teaching at brick kiln. During the baseline survey he was not able to read books but by the end of the year he was able to read books. In Math’s he could recognize numbers from 1-10 but after 3 months of practice he could recognize numbers from 100-999. He is also able to do simple calculations using addition and subtraction. At home his father helps him in studying and also doing homework. In his initial days in school he was a shy boy who did not talk much but now he has overcome his shyness and participates in all the activities of the class. During free time he also helps his father and brother in making bricks. 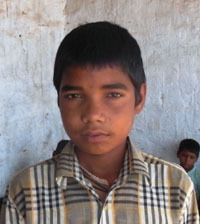 Kishan lives at Mahadev Brick Kiln with his 2 brothers and 3 sisters. His father Jagdish Mallah used to row boats in his village Sanowari in Kasganj tehsil of Etta district in Uttar Pradesh. When lots of people started playing boats in the river his income decreased. They have only one bigha of ancestral land which is too small to take care of the big extended family. Kishan’s father says that the day he had left boat rowing he and his wife along with 6 children left the village and began doing labour jobs. Kishan had never been to school because his family did not permanently live in the village. When they came to Mahadev Brick Kiln he was very happy to see the school on the premises. He was delighted to see that along with labour his children would also get an opportunity to learn something. During the baseline survey Kishan was at the primary level. He was able to recognize some Hindi alphabets and in Math he was able to recognize numbers from 1-100. At the end of the school year he is able to read Hindi letters and read sentences with hesitation. In Math he could recognize numbers from 100-999 and do simple addition and subtraction. 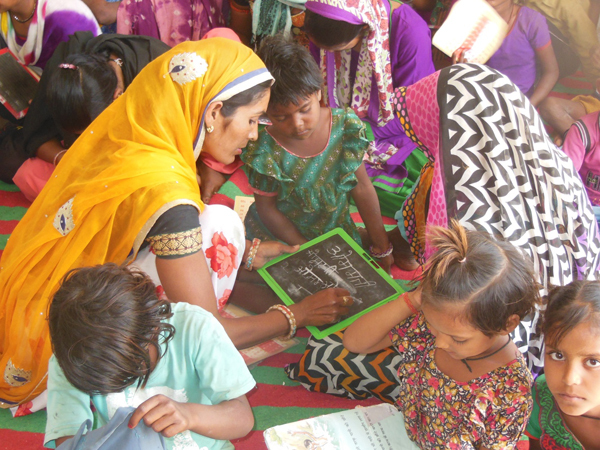 Collaboration with PRATHAM Rajasthan: PRATHAM is a national level organization working on providing quality education to children in rural areas. Support from PRATHAM Rajasthan office is being used for teacher training, course content and monitoring of students and teachers. With their cooperation a four day long teacher training was organized before the session started between 14-17 October 2016. A total of 25 teachers participated in this training program. A pilot of course materials, teacher training and monitoring schedule was done for about a month in the local schools. This helped in the planning for the new session. From January 2017 onwards the PRATHAM Training Officer began scheduling a monthly follow up meeting of all the teachers to improve their teaching skills. An evaluation system has been developed in which baseline of all the students have been collected when the classes started and every month an end line is done to see the progress of the students. Students’ performance report by PRATHAM: This year a detail record of student outcomes was collected in order to see their performance. There was a gap in the number of students who enrolled themselves in the school and the number of students who successfully completed the course. There were several reasons for drop-out (about 22%). The assessment of students is based on the baseline survey and 4 endline surveys conducted during the six months period between December 2016 – May 2017. Student Performance std. 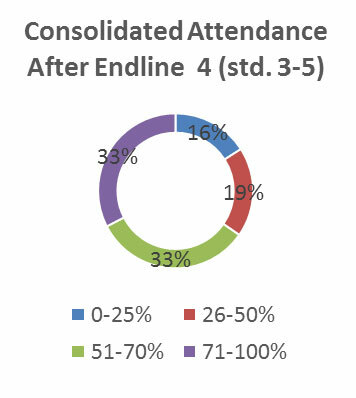 1-2: The attendance of students was not very regular. The main reason behind this was that the parent’s priority is money and not education. The poverty is so acute that the preference for money becomes important. But we tried our best to bring the students to class. The number of students studying in std. 1-2 who took part in the survey was 143. We found that 68% of the students were able to attend more than 50% of the classes. Language reading analysis: Significant progress was seen in language proficiency (Hindi). In the baseline almost all the students (about 90%) were at the beginner level i.e. they didn’t knew how to read and write, and most of them didn’t knew how to hold the pencil. But at the end of the session only 7% were at the beginner level, 50% were at the letter recognition stage, 28% were at the at word recognition stage and about 16% were able to read paragraphs and stories. Math number recognition: In the beginning 80% of the students were at the beginner level and this was reduced to only 2% in endline 4. Similarly 68% of the students were able to recognize numbers upto 100, which is a significant increase from 3% during baseline. Math operation analysis: Only 2% of students could do addition when baseline was done. In endline 4 this percentage increased to 43%. In the same way subtraction skills were increased from 1% to 30% during the same period. The progress in subtraction was slower as compared to addition but knowledge of addition must be mastered before the development of skills in subtraction. Student Performance std. 3-5: The students in this group are older and help their parents in making bricks. The number of students studying in std. 3-5 who took part in the survey was 144. 66% of these students were able to attend more than 50% of the classes. The attendance performance is more or less same in both the groups (i.e. 1-2 and 3-5). It is a very positive sign that parents are sending their elder children to school as when these children are in school the families are forgoing the labor income. 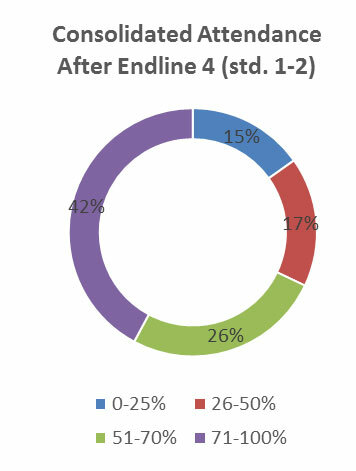 Language reading analysis: In the baseline only 16% of the students were able to read simple text but after endline 4 almost 83% of the students were able to read simple text. There were about 42% students who were not able to recognize letter during baseline survey, and this percentage was reduced to almost 1% by endline 4. Math number recognition: During baseline survey there were only 14% students who could recognize numbers 100-999. This increased to 82% by endline 4. There were 29% students who could not recognize any number at the time of baseline but during endline 4 this number was reduced to zero. Math operation analysis: During baseline only 20% of students were able to do addition; at the endline 4 about 98% of them were able to do it. In subtraction 13% were able to perform the operation at the time of baseline which increased to 89% by endline 4. In multiplication the percentage increased from 10% to 71%. The least increase was witnessed in division as here 54% were able to do the operation in endline 4 with baseline performance was 6%. Copyright © 2017 Kumarappa Institute Of Gram Swaraj.